The Bitcoin price is plummeting and looking for a floor. Meanwhile big players on Wall Street are working on their grand entrance. At the forefront of this: Goldman Sachs. What to do if you are stationed in the middle of nowhere surrounded by super computers? Exactly, you mine cryptocurrencies. This happened in a Russian government research center in Sarov, a secluded city 400km east of Moscow, the seat of the Russian nuclear program. The first Soviet atomic bomb was built here in 1949. And now researchers have been caught using the strongest computers the Russian state has to offer to mine cryptocurrencies. In our first report in 2018, we predicted a spell of crypto winter. Our technical analysis of the crash in January 2018 goes to show that a hard plummet right down to USD 2,500 is very possible. Other (especially pessimistic) analysis corresponds with this evaluation. Many are looking at the charts of the crash after 2013 for some sense of direction in which Bitcoin could go now. Especially bleak outlooks have been published since analysts saw a “Death Cross” in the charts in mid-March. Others, such as the crypto hedge fund “Pantera Capital Management” assume that we have already reached the rock bottom price of Bitcoin at USD 6,500, and we will therefore soon witness an upwards trend again. While we are finishing this report, prices are dropping again, then shooting up because of good news, then dropping again. Where do we go next? That is the age-old question – in hindsight we are always smarter. The markets are unpredictable and the crypto market is especially volatile. A study by the Warwick Business School showed that trades on the crypto market are made on a purely emotional basis instead of being based on fundamental analysis. The survey covered trade data from April 2016 up to September 2017, and the results do make sense. The crypto market is still dominated by small investors who don’t have the knowledge or data for a technical or fundamental analysis. On top of this, Bitcoin and Co. are still so relatively new that there is a real lack of accepted official data for an unbiased assessment. 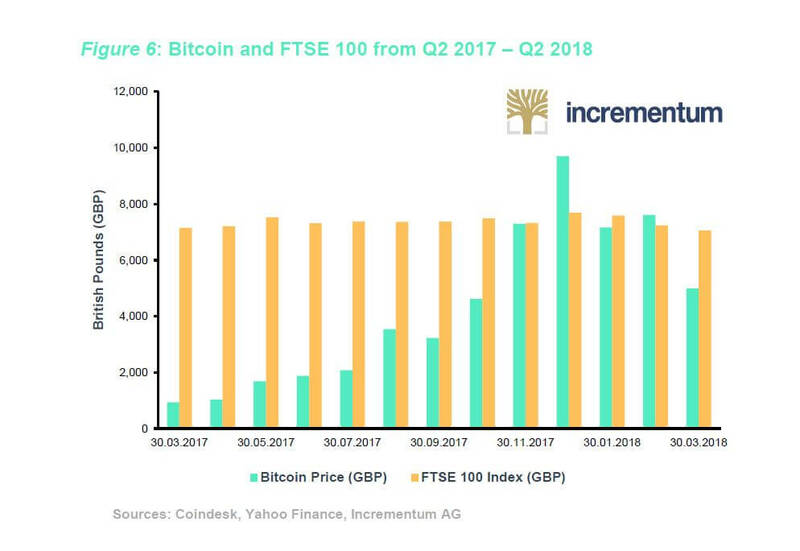 It is however noticeable that over the past few months more and more central bankers have had a closer look at Bitcoin – and in the process, have confirmed Bitcoin’s role as a currency as well as the fact that Bitcoin does indeed have value. One central bank economist sees the fundamental price (based on mining costs) at USD 1,800. The debate is however still ongoing. The author of the Warwick survey, Daniele Bianchi, has a similar view. “It’s not like with normal currencies, in which the productivity of a country influences the price. Instead, they have similarities to investments in shares of a high-tech company.” This phenomenon can be seen time and time again and economists are now discovering the new field of crypto economics. The puppet masters behind the various tokens try and create different incentive systems to pull in more investors. These tokens therefore almost turn into shares of the company or project at hand. At least they are traded like shares. An important factor in the price drop over the past few months has been the so-called Tokyo Whale. This is the nickname for the bankruptcy trustee of the now extinct exchange Mt. Gox. The hack and subsequent collapse of which lead to the bear market of 2014 and onwards. It is the Tokyo Whale’s job to sell the rest of Mt Gox’ Bitcoins as profitably as possible. In total, he will unleash 200,000 Bitcoins to the market. This will obviously not happen in one go, but according to media reports the trustee Nobuaki Kobayashi has trickled Bitcoins into the market worth USD 400 million since September 2017. By the beginning of February, he must have sold roughly 40,000 Bitcoins. What followed was a temporary recovery until Kobayashi moved 16,000 Bitcoins onto an exchange ready for the presumable subsequent sale. The community follows his wallets closely, as the game only ends when all 200,000 Bitcoins from Mt. Gox have been turned into “real” money. All these elements together make for an extremely volatile market. The least volatile cryptocurrency, measured by standard deviation of returns, in this market is Bitcoin. However, altcoins such as Ethereum and Ripple are also becoming increasingly popular on the market. 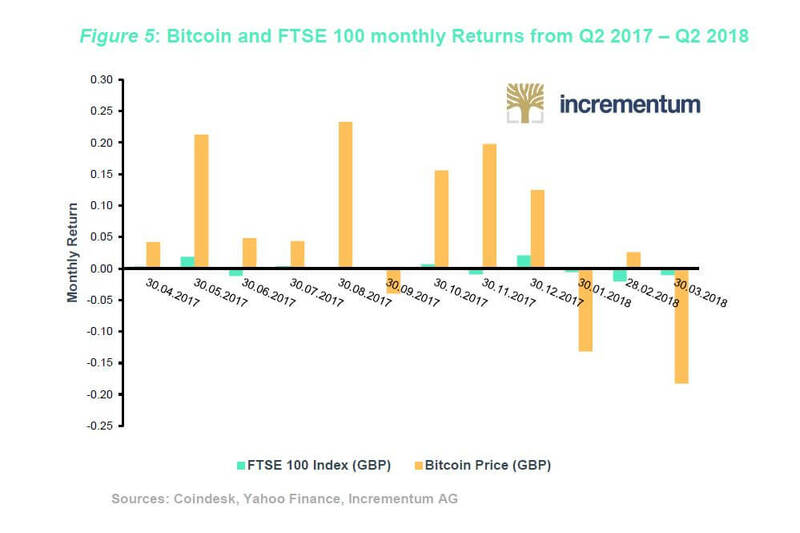 Market sentiment in June 2018 first showed signs of desperation, maybe even despair – in social media as well as in various forums. We are sure we will only start a new bull market once the weak hands have been swept out of the market. 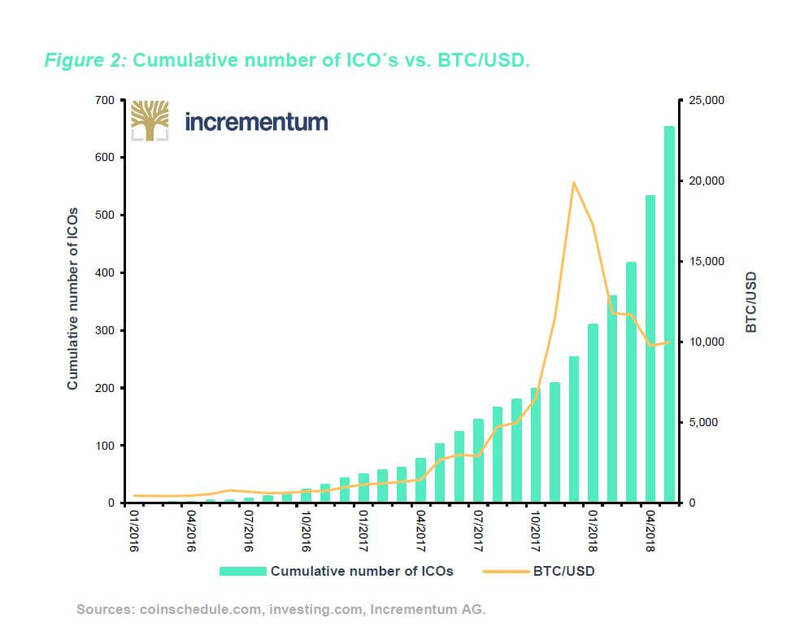 Investors which only joined the game during the ICO Boom of 2017 should be aware that although Bitcoin has survived such a “crypto winter” before, the majority of Altcoins however have not been put through the same test of time. It is true that such gloomy prophecies regarding Bitcoin have turned out to be wrong time and time again. But then again, we have been in good company when we have warned against the ICO Mania. This is why we must say the Goldman analyst could be right. A handful of projects could survive in the long-term, but many are facing the end before we leave this valley of death. The Godfather of cryptocurrencies Bitcoin has proven its stability before. While small investors are at home licking their wounds from the market downturn, the big boys are finally here to step into the ring. This is probably the most important trend of 2018, and we call it the “Goldman-Effect”. The second trend comes as a direct result of the first: the regulators are finding themselves under more and more pressure because institutional investors need legal security before they can enter the market. Early Bitcoin adopters and purists may note like to hear this, but Goldman is doing a lot for the legitimization and growth of the crypto sector. The investment bank, which has always thought of itself better than the competition, wants to be the first to get in on the new opportunity. The analyst from Goldman took a closer look at Bitcoin back in the summer of 2017. And now this. At the beginning of May, in a carefully choreographed article in the New York Times, it was made public news that “Goldman Sachs will be entering the trading floor of Bitcoin”. It was possible for Goldman to get in on the action through the implementation of futures and other derivates. However, the Goldman bankers aren’t the only ones buying up Bitcoin-Futures. The daily trading volume of the CME Futures in Chicago have risen by 250% since the initiation in December 2017. There is still room to grow. According to Reuters one fifth of the big banks want to enter the Bitcoin trade by the end of 2018. As of now, it is still prohibited for institutional investors to buy Bitcoin outside of regulated fund vehicles, trackers, futures, and trusts. They are however getting prepared for when the day comes that this will be possible, and they are putting real thought into how one can directly buy Bitcoin and store them securely for clients. One of them could be J.P. Morgan. This is highly interesting as J.P. Morgan’s CEO Jamie Dimon is a known Bitcoin skeptic. He has after all called Bitcoin a scam. He went as far as to say he would fire any employee who touches the stuff. The comments didn’t age well. In May, just a mere few months after Dimon’s last outburst, the U-turn was made official: J.P. Morgan is working on its own crypto strategy. They created a new position for exactly this purpose and found the 29-year-old Oliver Harris to fill it. Up until then he was responsible for J.P. Morgans Fintech-Program. J.P. Morgan seems to be still be a few steps behind the competition as direct trading with cryptocurrencies or even derivatives are as of yet, not on the horizon. Daniel Pinto, co-president of J.P. Morgan, separately told CNBC on Wednesday that the Wall Street giant was now “looking into that space”. “Cryptocurrencies are real, but not in the current form,” he said. We are left wanting further explanations by Dimon’s potential successor. But when Dimon revised his statement regarding Bitcoin and even noted that there was a viable future for the Blockchain technology, one could have known the bank was about to announce their official move towards the sector. Dimon is not the only one to change his mind when it comes to Bitcoin. The currency speculator George Soros had claimed just six months ago at the economics forum in Davos that Bitcoin was only interesting for a dictator wanting to keep some money safe on the side. A very lopsided view of things given that the technology actually allows the small man on the street to keep money away from a dictators as it is happening in Venezuela. Soros has changed his mind anyway. In April he gave the green light to his fund, which has USD 26 billion in assets under management to invest in Bitcoin. And yet another big name from the finance world has arrived: Venrock, the Venture Capital arm of the Rockefeller family (Ven stands for Venture, Rock for Rockefeller). Two of the most successful early investments of the company include Intel and Apple. Now they are heading into the crypto sector. In stark contrast to George Soros, Partner of Venrock David Packman doesn’t hold back his enthusiasm regarding the new industry. More specifically, Venrock has a partnership agreement with CoinFund, a company based in Brooklyn. Venrock is not alone in its mission to infiltrate the market. 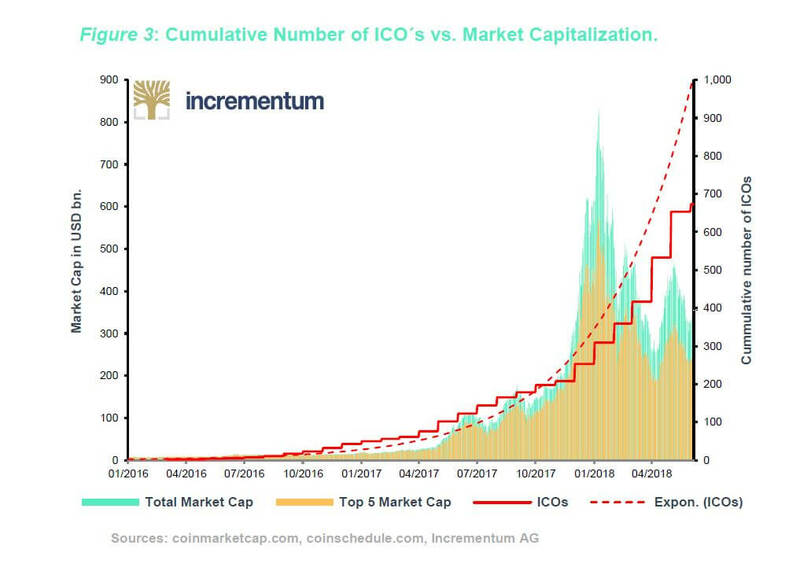 Despite the consistent popularity of ICOs more and more, Venture Capital firms are looking for a way into the game. In just the first three months of this year Blockchain companies have been able to pull in a combined investment of USD 400 million. 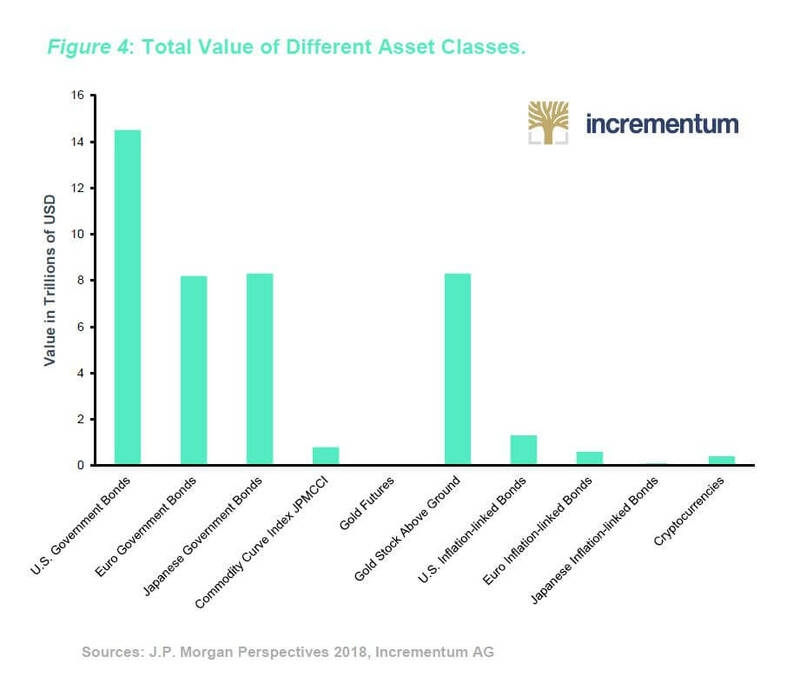 It is doubtful though that many of these are actual long-term investments like Venrock’s are meant to be. It seems to be the norm that investors buy in the Pre-Sale-Phase of an ICO since the value of their equity already rises through the ICO itself. As a comparison: Blockchain companies have had an influx of over USD 3 Billion via ICOs just this year. It comes at little surprise that many of the investors, no matter if they bought in the Pre-Sale-Phase or during the actual ICO, get rid of their shares quite quickly. Roughly half of all ICO funded projects have already failed. Many of these companies only exist on paper – the so called White Paper. This investment boom is compared time and time again with the Dot Com Bubble. Many big players within the scene, like Ethereum founder Vitalik Buterin, have called out for caution in regard to an ICO Bubble. In our past reports, we have not only given the subject much room but have also warned against a too flippant approach when investing via ICOs. Especially, since regulation bodies are also highly alarmed. The question if a coin which is financed via ICO is in fact a security, and should be regulated as such, puts this process very much in the legal grey zone. The US authorities have already convened on this subject, more specifically looking at the sector’s giants Ethereum and Ripple. A story which broke in the Wall Street Journal claiming there had been a meeting of regulatory authorities back in April caused for confusion and panic on the market. It is unclear to this day if said meeting actually ever happened. What we however did find out in the course of the coverage of this story is that Ethereum and similar products have gained a huge fan base in the Tech-sector. Defenders of the crypto world are organizing themselves in Silicon Valley – once again driven mainly by Venture-Capital-investors. This new lobby wants to persuade the regulatory bodies to at least not classify already existing and successful projects such as Ethereum as mere securities. Initially founded via ICO, Ethereum’s structure is now completely decentralized, they argue. And their voice seems to be heard. In a speech on June 15, the SECs point man on crypto, William Hinman, stated, that Bitcoin and Ethereum are in fact not to be treated as securities. However, he did not comment on Ripple. The US regulatory board SEC has also started to act based on the existing rules. A scam is a scam – even on the Blockchain. The founders of the cryptocurrency Centra were arrested in April. The charge: Their ICO had criminal intent and they relieved their investors of USD 32 million. Centra was supposed to be a crypto credit card and work together with Visa and Mastercard – at least that was what was advertised. Centra was not the first case to be looked into by the SEC. The AriseBank case, who’s ICO was also stopped, involved more than USD 500 million. The Centra case is so juicy marketing wise because the famous boxer Floyd Mayweather had publicly endorsed the ICO. To educate investors, the SEC went as far as to create its own fake ICO as a honeytrap. They even wrote a White Paper full of the specific Blockchain language for the fake project “Howeycoins”. “Howeycoins” set out to disrupt the global tourist industry. The website looked like many others of which ICO investors have seen plenty, it even included the famous count down timer to indicate when the bonus phase of the ICO was to kick off. Whoever clicked on “invest” ended up on the website of the US regulatory authority. This site also included a list of “red flags” to look out for and avoid. For example, ICOs with celebrity endorsements should rather be avoided instead of gravitated towards. This whole ploy was largely more successful than any official warning the SEC had issued up until then and shows that even regulators have a sense of humour. Authorities are also looking into potential price manipulation. The US Department of Justice has opened a new investigation in regard to illegal practices. This includes spoofing or strategically placed buy and sell orders used to manipulate the market, which are deleted before being activated. Also, the act of “wash trading”, the manipulation of prices through a participant who completes his own orders. The Billionaires Mike Novogratz and Cameron Winklevoss have both whole heartedly supported the supervisory authorities’ attempts in the field of cryptocurrencies. “Weeding out the bad actors is a good thing, not a bad thing for the health of the market,” Novogratz, said in a telephone interview. “Plenty of exchanges have these inflated volume numbers to create some sense of excitement around coins,” he said, citing his own experience trying to trade. One thing is for sure: the big players want in on the action. But only in areas where the rules are clear and above board can they actually also play. This has led to a behind-the-scenes race of the big names. It is not about investing now, it is about being the best prepared player when the time has come, the dust has settled and the rules are clear. This creates more pressure on the authorities to come up with rules which give investors and consumers legal security, but also don’t jeopardize this new sector. For this report, we have especially highlighted the role of the US authorities as they have been extremely proactive here. It should be noted that almost all countries are currently asking the same question: How can we regulate without strangling the Bitcoin sector? This means there is not only a race to regulate between states, but also between national governments and the international organizations. At the moment one can say the governments are leading the way. In some EU countries, such as Austria and Germany, there will be obligatory rules regarding ICOs soon. An overall EU law is currently not on the agenda. Although, the fifth know-your-customer and anti-money laundering directive is expected to include specific provisions for cryptocurrencies. As predicted in the last report, the attempts of the G20 have also been without results so far. However, even the managing director of the IMF, Christine Lagarde, has said that something is needed. Regulating the sector is unavoidable, she said, but a balanced approach would be commendable. Other participants are also preparing for the days with more transparent rules in the land of Bitcoin. The Intercontinental Exchange (ICE), the mother company of the New York stock exchange, publicly announced to be working on a Bitcoin trading tool at the same time the New York Times article about Goldman Sachs broke. The technology exchange Nasdaq also seems to be well underway in this direction. Nasdaq CEO Adena Friedman is quoted saying just in April of this year “There is no doubt that Nasdaq will consider becoming an exchange for digital cryptocurrencies.” That same day, Nasdaq announced a cooperation with the American Bitcoin exchange Gemini. According to some sources, the second largest exchange of the US could start trading Bitcoin as early as October 2018. These plans correspond perfectly with Goldmans and others plans. The big institutional players obviously need big, regulated exchanges in order to start trading. Goldman can’t just open a Binance account. However, there is another way. You can simply buy an exchange. The investment bank itself didn’t do so, but the start-up Circle which is supported financially by Goldman did. At the end of February, Circle acquired the popular crypto exchange Poloniex. The “NYT” journalist Nathaniel Popper got his hands on internal presentations which explain the motivation behind this takeover: Circle wants to keep Poloniex as an independent exchange, however they are looking to work very closely with the SEC. The goal: Circle wants to make Poloniex the first regulated crypto exchange in the USA. The slides read as follows: “By becoming the first regulated Crypto Exchange will enable Circle to list and provide a platform for all forms of emerging crypto tokens, including tokens that would be deemed securities. We believe the market for security-like tokens will continue to expand, creating demand for this market infrastructure. Circle (and evidently Goldman) are obviously preparing for a world in which regulated securities can be traded on the Blockchain as a token. The plan goes on: Circle wants to introduce a cryptocurrency which is bound to the Dollar. A Crypto-Dollar by a company which is covered by Goldman Sachs would be a complete and utter game changer. The issue of regulation is completely open in this aspect as well. Similar to Warren Buffett, who misses no opportunity to hate on Bitcoin, companies such as Vanguard have no interest in making Bitcoin sound too interesting as an investment. They want their clients to continue to put their money in traditional investment opportunities. There is more behind this all than the mere discussion and discourse about the Blockchain technology. It is a generation conflict. Millennials, people aged between 18 and 39, are deeply influenced by the last financial crisis. This coincides with the fact that this is the generation which grew up with internet access. A whole row of studies show that Millennials are the most likely to be interested in crypto assets. The combination of technological trust and wariness towards the financial system is a dangerous one for providers of legacy investment products. It is to be expected that established players such as Buffet and Vanguard will be become more and more outspoken against Bitcoin. Others such as Goldman have already decided to go a more proactive route and be first in line when it comes to institutions embracing the new sector. And others like J.P. Morgan have proven that they can and must change their thinking. Of course, at the moment it is still unclear if the crypto exchanges of today will even be around tomorrow. The current market leader Binance is just over a year old. If established players such as Nasdaq really set their sights on these markets, they will subsequently also be able to pull in a lot of investors. This is however in the distant future. There are still a few battles to be fought – also in the generational conflict of the exchanges. One player deserves special attention: Coinbase. Subject of many chats within crypto forums is the speculation of which coin will next be released on the Coinbase platform. The “standard” app for Bitcoin newbies has more than 20 million clients – more than the traditional US investment management firm Charles Schwab. The US company is currently expanding in many directions simultaneously. The Coinbase app is available in 32 different countries and has additionally initiated a crypto fund. The fund is currently only available for US investors and only if they decide to invest at least half a million USD. The name of the new venture speaks volumes of where this ride will take us: Coinbase Asset Management. Coinbase has its own exchange, Gdax, which will soon be relaunched as “Coinbase Pro”. Additionally, Coinbase recently purchased Paradex. This “decentralized” exchange not only takes care of the storage of tokens of their customers, but also allows users to directly trade with each other. Speculators say the purchase of Paradex is paving the way for Ethereum based ERC20 tokens to be launched on the Coinbase exchange. Currently the app only offers four cryptocurrencies: Bitcoin, Ethereum, Litecoin and Bitcoin Cash. Ethereum Classic could also be added soon. Last but not least, Coinbase has also entered the Venture Capital sector and has initiated their own incubator fund for start-ups in the crypto sector. “It could be possible that we start investing in companies that look a lot like competition for Coinbase. We have a long-term perspective and believe that different approaches are healthy and viable”, Coinbase stated on their blog. Predictions are always tricky. 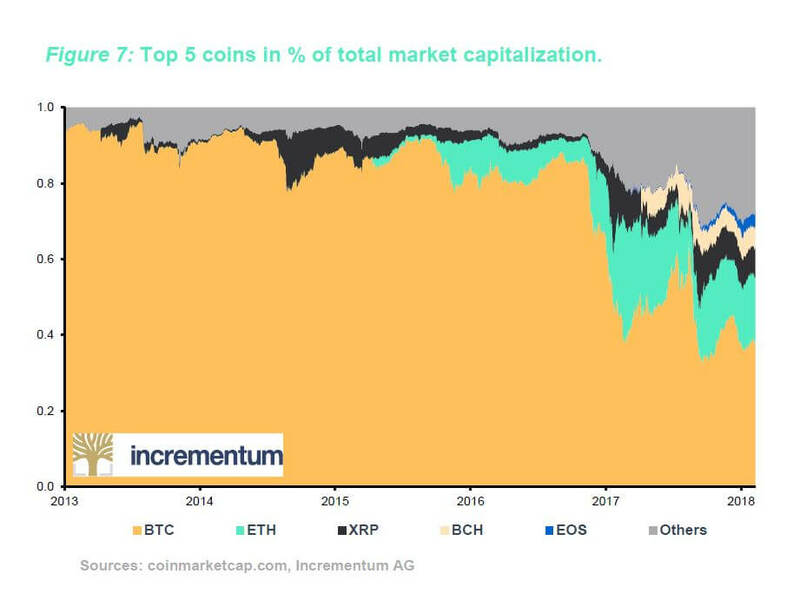 But the abundance of activity within the Bitcoin sector since the crash of January 2018 goes to show that cryptocurrencies are far from dead. It is however still most probable that only a few of the Boom phase projects will survive in the long run. The overall dominance of Bitcoin is not in danger at the moment. The infrastructure side of things promises to be very active in the coming months. We will stay tuned. New players such as Binance are attacking companies like Coinbase. In addition, there is a continuously growing list of newcomers: from Goldman all the way to start-ups like Revolut or exchanges such as Nasdaq. Within the crypto market itself, there are of course also many promising projects. While the market is still recovering from the ICO Bubble, new coins which aren’t based on the classic Blockchain are gaining traction. One example is the Iota project which is already pretty popular in Europe, and is investigated in length in next chapter of this report. Bitcoin and the crypto sector have become mainstream. We won’t find out what this all really means until we have finally come out the other side of this valley of doom. As with most things in life, in hindsight we will be wiser as to where the real bottom of the Bitcoin price in 2018 was and if we have already seen it or not. See “Russia Busts Crypto Miners at Secret Nuclear Weapons Lab,” Stepan Kravchenko, Bloomberg, February 9, 2018. See “Naval Academy Rocked by Drug Scandal; Ring Bought Cocaine With Bitcoin,” Tyler Durden, Zero Hedge, February. See “Bitcoin’s ‘Death Cross’ Looms as Strategist Eyes $2,800 Level,” Todd White and Eddie van der Walt, Bloomberg, March 16, 2018. See “Crypto Hedge Fund Says Bitcoin Has Bottomed Out,” Camila Russo, Bloomberg, April 12, 2018. See “The Fundamentals Driving Crypto Trading? There Aren’t Any,” Julie Segal, Institutional Investor, May 24, 2018. See “A Short Introduction to the World of Cryptocurrencies,” Aleksander Berentsen and Fabian Schär, Federal Reserve Bank of St. Louis Review, 2018, 100(1), pp. 1-16. See “Making Sense of Bitcoin Price Levels,” Joost van der Burgt, Federal Reserve Bank of San Francisco, April 2018. See “Inside The Bizarre Upside-Down Bankruptcy of Mt. Gox,” Adrianne Jeffries, The Verge, March 22, 2018. See “Mt. Gox Trustee Sold Half a Billion Dollars Worth of Bitcoin and Bitcoin Cash,” Trustnodes, March 7, 2018. See “Bitcoin’s Tokyo Whale Sold $400 Million and He’s Not Done Yet,” Go Onomitsu, Bloomberg, March 7, 2018. See “Get Ready to See Most Cryptocurrencies Hit Zero, Goldman Says,” Kana Nishizawa, Bloomberg, February 7, 2018. See “Bitcoin Obituaries,” 99Bitcoins, 2018. See “Blankfein Says He’s Just Doing ‘God’s Work’,” Dealbook, The New York Times, November 9, 2009. See “Goldman Sachs to Open a Bitcoin Trading Operation,” Nathanial Popper, The New York Times, May 2, 2018. See “The CME recorded an all time record volume of its 5-lot BTC futures yesterday,” Jon Najarian, Investitute, April 26, 2018. See “One in five financial institutions consider cryptocurrency trading, says survey,” Reuters, April 24, 2018. See “Jamie Dimon Slams Bitcoin as a ‘Fraud’,” Hugh Son, Hannah Levitt and Brian Louis, Bloomberg, September 12, 2017. See “JPMorgan launches crypto strategy months after Dimon ‘fraud’ warning,” Paul Clarke, Financial News London, May 17, 2018. See “JPMorgan has asked 29-year-old highflier to draw up a cryptocurrency strategy,” Oscar Williams-Grut, Business Insider Deutschland, May 17, 2018. See “JPMorgan’s Wall Street chief talk China, bitcoin, Amazon, and is preparing for an inevitable big downturn in stocks,” Hugh Son, CNBC, May 16, 2018. See “George Soros Prepares to Trade Cryptocurrencies,” Alastair Marsh, Saijel Kishan and Katherine Burton, Bloomberg, April 6, 2018. See “It Started With the Rockefellers: Now it’s Takin on Crypto,” Robert Hackett, Fortune, April 6, 2018. See “VC Firm With Rockefeller Roots Turns to Crypto Startup,” Olga Kharif, Bloomberg, April 25, 2018. See “Rockefeller’s VC Arm Venrock Partners With Coinfund, Exec Highlights Focus On Long Term,” Molly J. Zuckerman, CoinTelegraph, April 8, 2018. 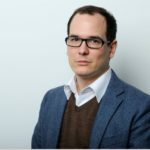 See “Blochain-Startups haben dieses Jahr bereits mehr Investment bekommen als 2017,” Jakob Steinschaden, Fortune, April 6, 2018. See “Venture Capital Surges Into Crypto Startups,” Olga Kharif and Camila Russo, Bloomberg, March 26, 2018. See “46% of Last Year’s ICOs Have Failed Already,” Kai Sedgwick, Bitcoin.com, February 23, 2018. See “World’s Second Most Valuable Cryptocurrency Under Regulatory Scrutiny,” Dave Michaels and Paul Vigna, The Wall Street Journal, March 1, 2018. See “Bitcoin and ether are not securities, but some initial coin offerings may be, SEC official says. “ Bob Pisani, CNBC, June 18, 2018. See “The SEC Is Finally Cracking Down On ICOS,” Tyler Durden, Zero Hedge, March 1, 2018. See “Founders of cryptocurrency backed by Floyd Mayweather charged with fraud by SEC,” Arjun Kharpal, CNBC, April 3, 2018. See “ICO Howeycoins,” Investor.gov, 2018. See “U.S. Launches Criminal Probe into Bitcoin Price Manipulation,” Matt Robinson and Tom Schoenberg, Bloomberg, May 24, 2018. See “Probe into Bitcoin Price Manipulation Probably ‘A Good Thing’, Novogratz Says,” Camila Russo, Bloomberg, May 24, 2018. See “ICOs: EU-Kommission plant in naher Zukunft keine einheitliche Regulierung,” Bastian Kellhofer, Trending Topics, March 9, 2018. See “An Even-handed Approach to Crypto-Assets,” Christine Lagarde, IMF Blog, April 16, 2018. See “Nasdaq May Launch Bitcoin Trading in October 2018,” Marko Vidrih, Medium, April 27, 2018. See “Circle Acquire Poloniex,” Sean Neville and Jeremy Allaire, Circle, February 26, 2018. See tweet by Nathanial Popper on Twitter, February 26, 2018. See “Vanguard chief: You will never see a bitcoin fund from us,” Thomas Franck, CNBC, January 22, 2018. See “A bitcoin bubble made in millennial heaven,” Financial Times, 2018. See “Crypto Exchanges Are Raking in Billions of Dollars,” Camila Russo, Bloomberg, March 5, 2018. See “The SPY of Crypto? Coinbase Launches Cryptocurrency Index Fund,” Tyler Durden, Zero Hedge, March 6, 2018. See “Coinbase acquires cryptocurrency trading platform Paradex,” Anna Irrera, CNBC, May 23, 2018.